In Hebrew words and names are of great significance, thus it is strange to name a holiday Shavuot, “Weeks”, a name that isn’t really a name but a description of a period of time - the seven weeks from Pesach to Shavuot, between the exodus from slavery in Egypt and taking on the responsibility received when the Nation of Israel was given the Torah. Never were the Nation of Israel more united than at the moment when we stood at Mount Sinai and received the Torah. Together we agreed to take on the responsibilities we were chosen for. That moment was so powerful that it changed the world – not only for the Nation of Israel but for all other nations who accepted the 10 Commandments as guidelines for a moral and decent society. We are stronger when we are together. How can we recreate that powerful experience, coming together as one people, united (although not uniform)? In ancient Israel, Shavuot was one of the 3 pilgrimage holidays where everyone would bring the first fruits of their harvest to Beit Hamikdash, the Temple that stood on the Temple Mount in the heart of Jerusalem. The Temple and everything it represents is the reason Jerusalem is a holy city. The Temple was destroyed in 70 CE but has remained integral to Jewish life ever since. Now, thankfully the fruits of Israel are once again brought forth from the Land by the Nation of Israel. The Temple is the spiritual connection of the Jewish People to the Land of Israel and the harvest is the physical connection to the Land. Both are integral elements of Jewish identity. Though the Temple no longer stands and we may not live in Israel we can still experience that unique bond through our connection to the Land of Israel. 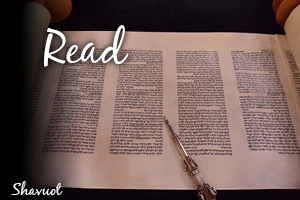 Shavuot is a very special holiday that, often gets overlooked by most Jewish communities in the diaspora. 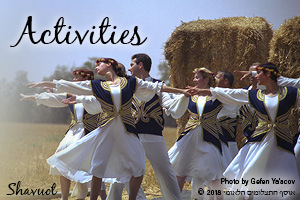 In Israel, Shavuot is treated by many as a festival of dairy products. Why are we paying so little attention this important holiday? Is it due to lack of knowledge of the meaning of the holiday? Is it because, in the diaspora, it has become so uncomfortable to identify as a Jew, connected to Zion that we are forgetting our own traditions? What does this mean for the future of our people? 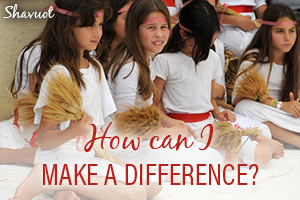 Our collection of Shavuot materials was designed to help you explore these questions and find your own way to connect to this special holiday.